Rainbows… Pretty, bright, colourful rainbows! Who doesn’t love rainbows?! I know I do! Pretty colours always cheer me up! 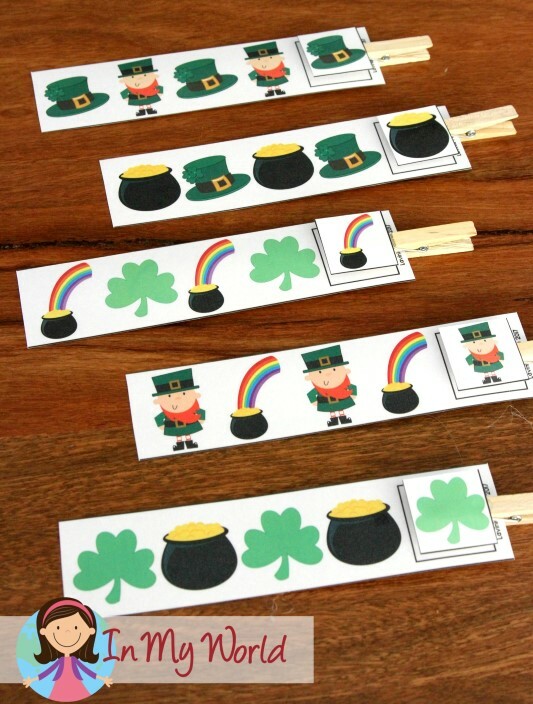 I included a couple of rainbow activities in my St. Patrick’s Day packet for preschool and kindergarten kiddos, but I am certain at some point in time, I will make a packet with all things rainbow! PLEASE NOTE: This blog post contains sample pages from my St. Patrick’s Day Preschool Centers packet. You can download the free sample pages by click on the photos. 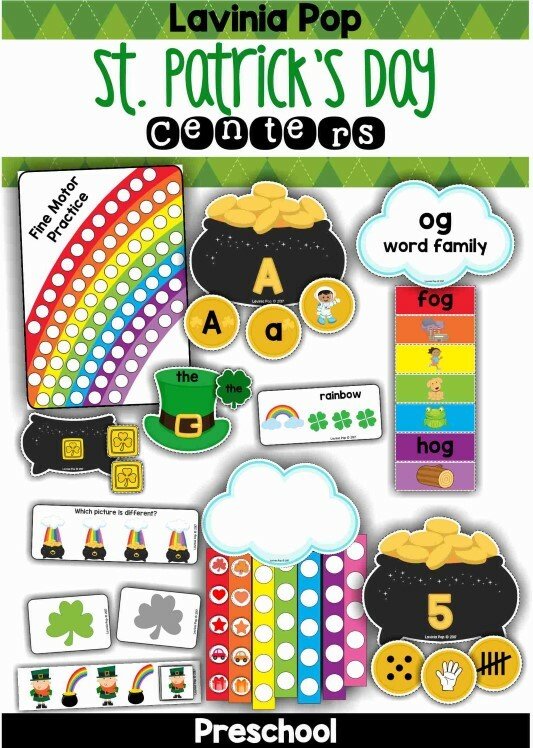 To purchase the complete St. Patrick’s Day Preschool Centers packet, please click here! 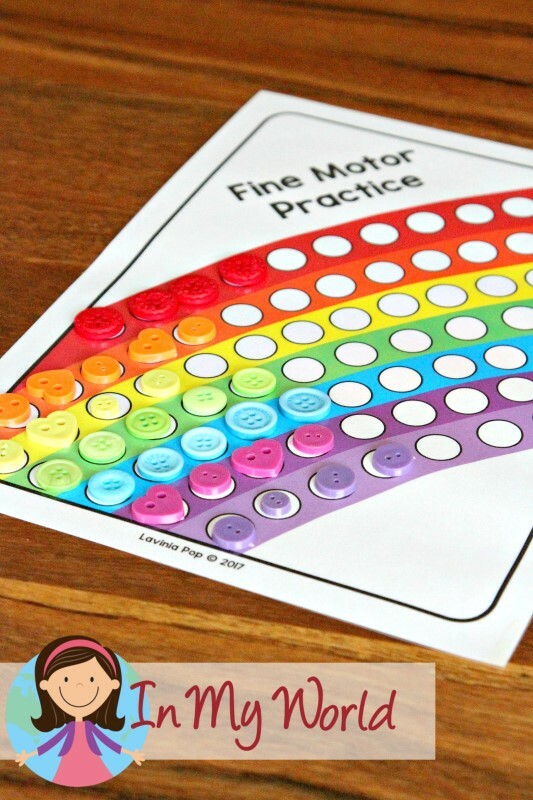 My favourite activity from this packet is the fine motor practice mat. Why? Because it’s so perfectly bright and cheerful, of course! This mat is also ideal if you’re teaching your kiddos ROYGBIV to help them remember the rainbow colours! 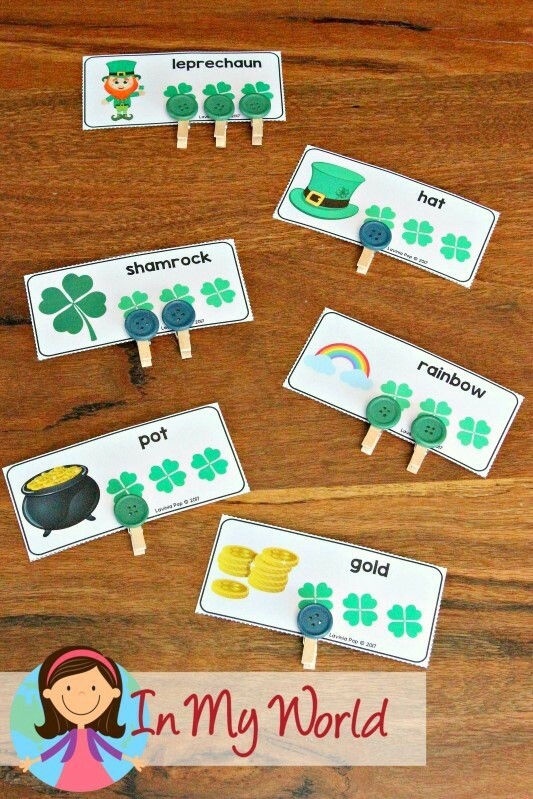 I included a pot of gold and gold coin alphabet and beginning sounds sorting activity. This activity can easily be differentiated and you can have your kiddos match upper case letters only, upper and lower case letters, or letters and beginning sounds. Next, I included a syllable counting activity. Children show their answers by clipping pegs to each clover. Next up is another super fun rainbow activity! Children are required to match the different cards to the correct word family cloud. You can attach small pegs or velcro dots to keep the pieces intact, or you can use this activity in a pocket chart center. I also included a complete pre-primer sight words activity. Children are required to match the shamrocks to the correct hats. For the next activity, I glued the coloured strips to the cloud and, while I didn’t do this, it would be ideal to attach velcro dots to the back of each circle to keep them circles moving around and frustrating your little dears. The aim of this activity is to sort the circles with various coloured objects to the matching colour strip. 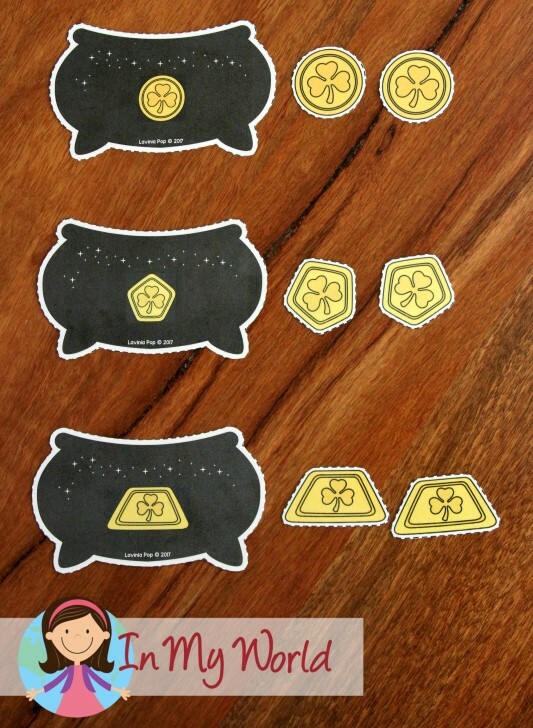 The next activity can also be differentiated: you can have children match only one coin with your desired number representation to the correct pots of gold, or all three coins. Next, is a very simple shape sorting activity. 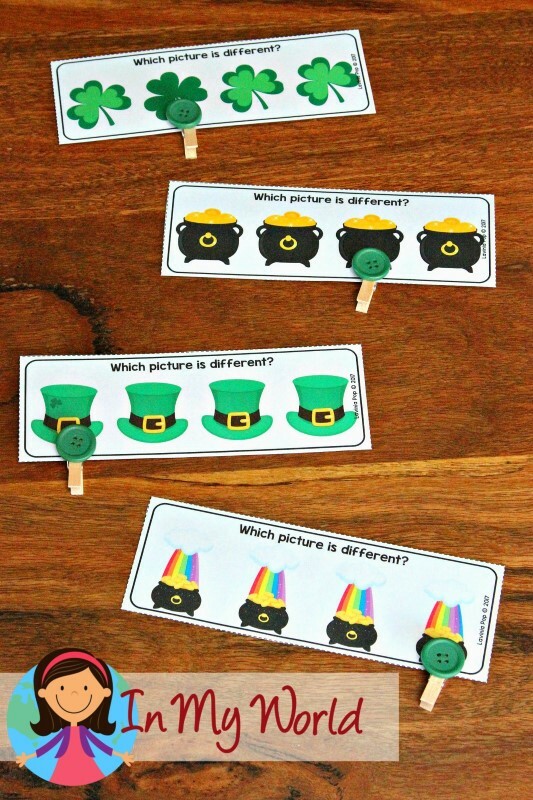 I have also included a St. Patrick’s Day “Which picture is different?” clip it activity. And to finish off the packet, I included an AB pattern activity. 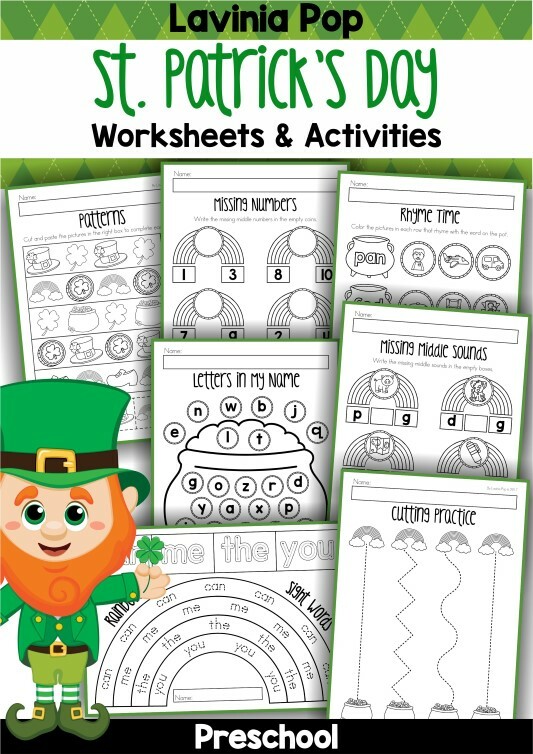 If you liked the samples from this post, you can purchase the complete St. Patricks’ Day Preschool Centers packet by click the picture below. If you’re thinking: “Wow! This packet requires too much prep time,” you might perhaps like the St. Patrick’s Day worksheets packet below. Click the picture to check it out in my Tpt store. While there, be sure to download the preview to check out some sample pages!